DATE/TIME: March 19, 2019 / 08:06 a.m.
Central Station has a dedicated Child and Adult Protective Services Deputy who investigates allegations of child and elder abuse. On March 18, 2019, Deputy Ortiz began an investigation after receiving a referral from Children and Family Services. The allegation was physical abuse to a 4-year-old male victim. The case was investigated, and evidence was gathered that substantiated the allegation. On March 19, 2019, Central Station Detectives located the suspect, Cameron Martin. Additional evidence was gathered, and Martin was arrested and booked at the Central Detention Center for felony physical child abuse with bail set at $100,000. 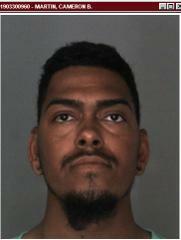 He is expected to be arraigned on Thursday, March 21st in San Bernardino Superior Court. The public is urged to call or text law enforcement when they see suspicious activity. Martin's photo is being released and any additional victims or witnesses should call Central Station at (909) 387-3545. Callers who want to remain anonymous can call the We-Tip Hotline at 1-800-78-CRIME(27463), or they can use www.wetip.com.